Of all the bus interfaces available in the industry today, USB 3.0 and Thunderbolt are the two currently going toe to toe with each other. Both interfaces are getting ready for some new modifications to make each perform better, triggering a renewed war of sorts. The competition between the two interfaces is obvious. But with recent news of Acer finally dropping support for Thunderbolt, does that mean that USB 3.0 is getting groomed for victory? A side by side comparison of the two interfaces would be useful in determining the weight each interface holds with the consumer. The performance of both interfaces are tip top. But if we were to base performance solely on speed, then Thunderbolt clearly wins out. The interface possesses a 10 GB/s transfer that’s significantly faster than USB 3.0’s 5 GB/s standard. There is one catch to this that tends to level out the field for USB 3.0. Most users are good with 5 GB/s; in reality, the additional 5 GB/s that Thunderbolt provides is preferred only by professionals who regularly work with extremely large video and image files. 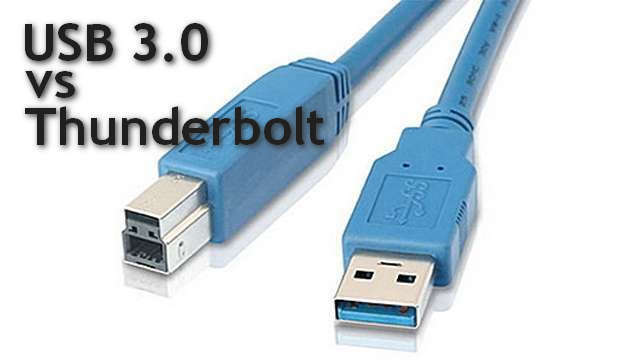 Outside of the speed arena, USB 3.0 is more versatile than Thunderbolt. A USB 3.0 port can act as a data transferring port, as a charging hub and is backwards compatible. Thunderbolt can only daisy chain up to six devices with the use of one port, but it cannot power any one of those devices. In terms of price, USB 3.0 is the clear winner. As a matter of fact, it’s the main reason why Acer has chosen the interface over Thunderbolt. Thunderbolt parts are expensive in comparison. A controller for two ports will cost a manufacturer $10, and a Thunderbolt cable can set the consumer back $50 apiece. Thunderbolt’s rationale behind this is that it’s offering a premium grade product. However, by doing so, it’s alienating a large part of the market that doesn’t cater to the idea of premium. Thunderbolt’s biggest problem, made even more evident by the recent news from Acer, is its weakness in the usage area. In order to anything to survive in the technology industry, people must derive some use out of it. For all its power and speed, Thunderbolt lags behind USB 3.0 in usage. Outside of the professionals circle, hardly anyone uses it, and not even backing from an influential company such as Apple is doing much to boost its popularity. Compare that to USB 3.0, which is selling out with PCs left and right, and you’ve got an unfavorable situation for Thunderbolt. Though it seems that Thunderbolt is the loser here, there are loyal users who stick by it, and ultimately, it’s always about the preference of the consumer. This entry was posted in Acer, USB 3.0 and tagged acer, SuperSpeed USB, Thunderbolt, USB 3.0. Bookmark the permalink.